Drew Price with his personal-best longnose gar, which measured 48 inches long. The first time I ever saw a longnose gar, I was a child visiting a public aquarium, and I was mesmerized by the fish’s unusual shape and elongated mouth. Lake Champlain has a sizable population of Lepisosteus osseus, and when I first started seeing them hanging out in shallow bays, I knew I had to figure out how to catch them on the fly. I did some research and then got to work figuring out the best way to deal with their myriad teeth and bony mouths. Now, when conditions are right, I enjoy fishing for, and putting clients on, these prehistoric-looking beasts. The longnose gar is actually a fairly primitive fish. It is one of only seven members of the gar family, Lepisosteidae, all of which are found in North and Central America. The gars are characterized by a heterocercal tail (one lobe of the tail is longer than the other, like a shark’s), hard ganoid (diamond-shaped) scales, and a mouth full of teeth. They have the ability to take oxygen from the surface, thanks to a specialized air bladder. This allows these fish to live in soupy backwaters that many other species don’t find attractive. Baitfish are the primary food source for gar, but they are not averse to eating the occasional frog or any other tasty morsel that presents itself. Gar are pretty easy to spot: they look a lot like a stick with fins. When you are first looking for gar, the fish that are moving will be most obvious. When they are really active, you will see then slashing on the surface and occasionally waking, as they chase down a meal. You might even catch one snapping its beak on the surface as it grabs some air. One of the first things folks ask me before they cast to a gar is, “Which way is it pointing?” That is a rather important question, and there are a couple of ways to tell: first, look for the skinny end, since the tail end is much wider; and the fins are triangular shaped, with the tip of the triangle pointing forward. If you cast to the tail of the fish, you won’t get the results you want, I promise! 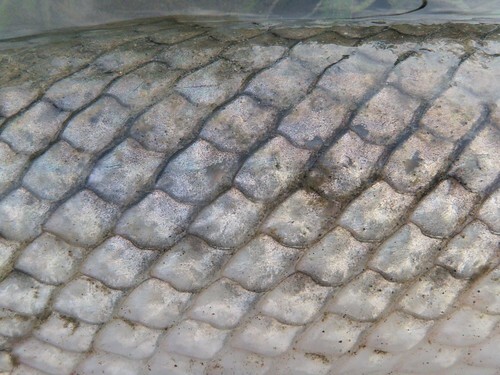 The diamond-shaped, or ganoid, scales of a longnose gar. Targeting gar is pretty easy. Cast your fly a few feet beyond and a few feet in front of the fish. A gar generally won’t move until the fly has gone past, and then there is a real burst of speed and the fish grabs the fly. This is a critical moment fishing gar because, if you set the hook, you won’t get your fish. Mostly because there is no hook. What? you may say. Most gar fishing I do uses hookless flies made out of unbraided nylon rope. Setting the “hook” will result in a lost fish because you’ll usually pull the fly out of the fish’s mouth. The gar’s mouth is almost all bone, and it is very difficult to penetrate with a hook. The rope fly instead gets caught up in their teeth, and this is what allows you to catch the fish. After the gar has had a chance to chew on the fly for a couple of seconds, then you apply some pressure, and the fight is on. Every gar seems to fight a little differently, but don’t be surprised to experience jumps, runs, and a lot of surface splashing. The fight generally isn’t too long, though. Landing these fish can be interesting, and I highly recommend wearing gloves. Between the sharp teeth, hard scales, and other pointy things on gar, you can end up with shredded hands or skin if you aren’t careful. An inexpensive pair gloves (rubber- or silicon-covered cotton or just plain leather) will provide more than adequate protection. These fish do thrash around a lot and can be difficult to control, so be careful when you have them in the boat. I ended up with four teeth embedded in my right palm this past spring. They worked themselves out of me over a six-week period. I have to admit that I thought it was pretty cool finding them in there! tough yarn that will tangle in the fish’s pointy teeth. Take your time extracting the fly from the beak. Sometimes you can just hold the fly with pliers and let the gar thrash, and the fish will come right off. Other times, you will need to use something to help keep the mouth open, so you can more easily remove the nylon fibers from their mouth. Remember that these fish breathe air, so as long as you are keeping them moist, you won’t harm them. They are tough fish! Tackle for gar is pretty simple: an 8- or 9-weight rod will cover most situations. Use a leader of about 6 feet or so, with about a foot of 50-pound-test fluorocarbon as a bite tippet. Gar have pointy little teeth that are not likely to slice a leader like those of a pike, but it is better to err on the side of caution. 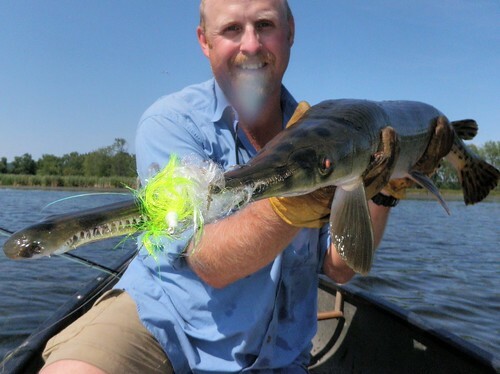 The most critical piece of your terminal tackle is the gar fly. I tie unbraided nylon rope to a hook and then dress it up with some flash or other materials. Once the fly is tied, I cut off the hook. However, to be legal in Vermont, there needs to be a hook point on the fly, so I do end up lashing a size 16 to 20 hook along the hook shank during construction of the fly. Yes, it’s kind of silly, but you have to admit that it sounds pretty cool to tell people you caught a 44-inch fish on a size 20 hook. Keep the fly between 6 and 9 inches long for best results, since longer flies have more material to grab onto and catch. 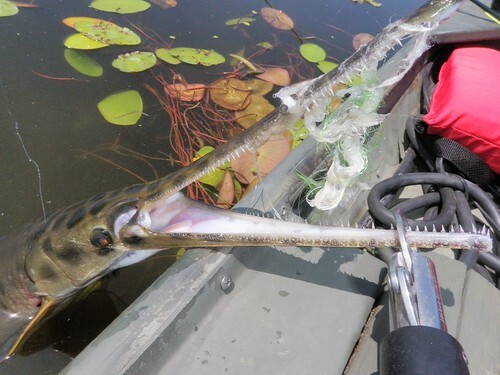 Good gloves make it safer to deal with an aggressive gar’s teeth. Timing is pretty important. In this area, gar are available to anglers from May through September, with the warmest months being the best time. They congregate to spawn in the springtime, and that can be a great time to target gar, as well. I got my personal best fish–48 inches and 12 pounds–this past May on a 6-weight rod. The spring fish seem to like smaller flies, such as Woolly Buggers, which is what worked for me. 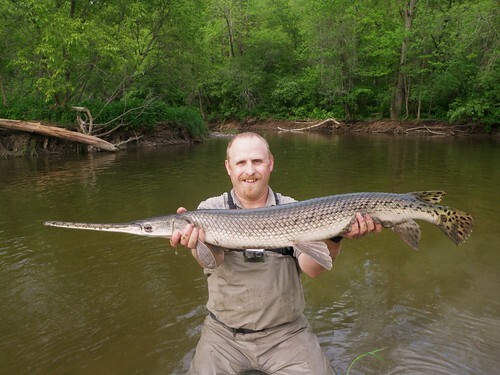 Gar are often overlooked by fly anglers, but they are a lot of fun on hot summer days when not much else is going on. I know plenty of guys who have cast to them without much luck, but once you get the right fly and put some time into chasing them, you’ll enjoy some wild action. Try it, and I think you will have a gar-reat time! Drew Price lives in Northern Vermont is the owner and head guide for Master Class Angling. He fishes Lake Champlain and surrounding waters targeting carp, pike, bowfin, gar, bass and other species (even the occasional trout). You would do the same for other gar right? You are a horrible speller. Where do you buy rope flies?